It’s a Bad City. A working class area. People walk in straight lines to their destination, rarely looking up and never taking time to smell the roses. At night others emerge to steal the night. Some would do favours. Some seek them. Some would take what they can. But in between the drab days and dark nights are many lights. Despite this film being shot in black and white it contains vivid imagery, colourful characters and pulsing musical sequences. That said it all seems very ‘look what I can do!’, the work of an artist, not an artiste. This is an Instagram friendly slideshow, not a story. So we have a transvestite dancing with a balloon. A handsome young rebel. An ageing woman. Junkies that pop in and out of the story. A waifish female vampire who gets around on a skateboard. Yes this is all very attention grabbing, and for sure the critics fell over themselves gushing that is the dawn of nu-horror, or something. But this isn’t that. It is a well crafted and expertly realised student film. 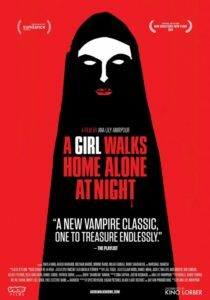 A film with a voice but not much of a point, unless skateboarding vampires masks a message I missed. Then again I do miss a lot of messages. Final Rating – 6 / 10. Watch it and make up your own mind. But for a black and white film this only coloured me nonplussed.